2.High quality-100% BPA free; Built-in permanent stainless steel mesh filter with high heat resistance. 3.Depending on how much coffee you consume, you could be saving hundreds or thousands of dollars each year. 5.Easy to clean, they clean up quickly with warm, soapy water. 1.High Quality -- Made of 100% Food grade PP plastic and stainless steel, durable, reusable, BPA free, safe to use. 2.Easy to Fill And Clean -- Choose your favorite coffee and have it taste the way it should. Not only that, but they clean up quickly with warm, soapy water. 3.Save Money --Not only are you saving the environment when you use our reusable filter, you're also saving tons of money in the process. Depending on how much coffee you consume, you could be saving hundreds or thousands of dollars each year. 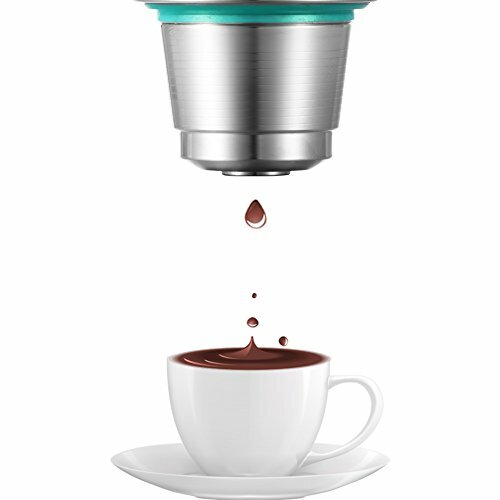 4.Compatibility -- These capsules work for different kinds of Nespresso Coffee machine models(Except U Series). 5.Environmental Protection -- When you choose to use our reusable and refillable capsules, you're making contributions to saving our planet away from more plastic and aluminum.